The scent of these Kind bars always reminds me of eating smores near a campfire. Sometimes memories are easily triggered by certain smells. These Mocha Almond bars have a rich dark chocolate taste. The ingredients list coffee, but I mostly taste chocolate. It doesn’t have a caffeine content listed, and I would guess that it’s not very high. 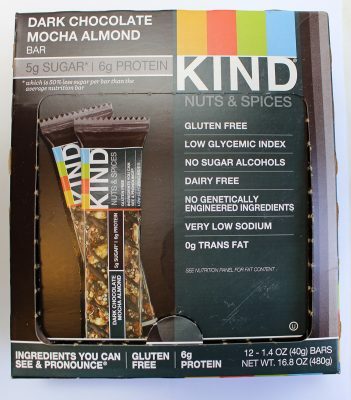 These bars are part of the Kind Nuts & Spices series, which includes so many interesting flavors. I’ve yet to buy one that I didn’t enjoy. A Kind Bar is Always a Treat! Chocolate and Almonds - Oh My! It’s hard to be very critical of these delicious snacks, but since I’ve eaten a lot of Kind bars recently, let me make a few comments on how these compare. These are tasty, but a little harder on the jaw than some of their other nut bars. Personally, I think I prefer the Dark Chocolate Chili Almond and Caramel Almond flavors a bit more. But each flavor is so unique, and the nutrition profile is pretty good. It’s low in sugar and high in fiber and with all natural sounding ingredients. 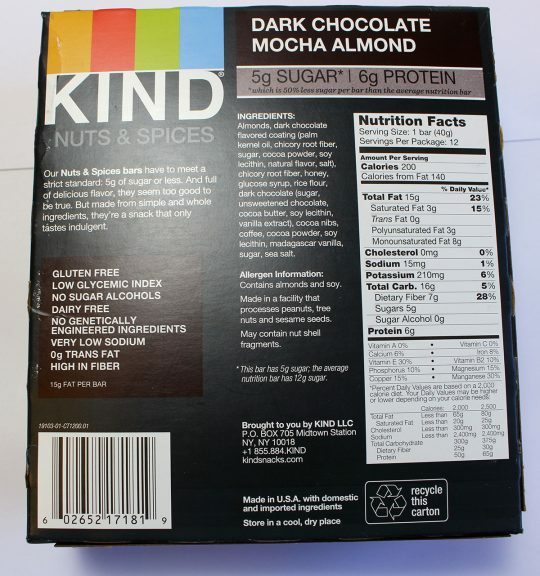 If you love chocolate and almonds, I think you will like these.